CasterHQ's Drive Wheels are manufactured in the USA and commonly used on Mobile and Automated Equipment, Powered Equipment, Towing, Heavy Lifts, and even Conveyors. 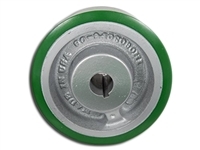 We Manufacture Drive Wheels in both Polyurethane on Steel Wheels or Rubber on Steel Wheels. We can provide replacement Drive Wheels for most bore sizes on an existing piece of equipment by contacting us directly with your measurements. If you have a custom wheel and need to re-tread the polyurethane or rubber back onto the core we offer custom in house wheel re-bonding services to get your old wheels back to new. 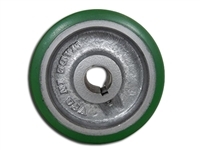 Rebonding Caster Wheels is very common on specialty wheels that are not easily found in the industry, especially for large expensive wheels. CasterHQ's Keyed Drive Wheels are Made in the USA and standard lead time is around 2-3 weeks from when the order was placed since all Drive wheels are custom made per order.